This APPLE THEME unit is chock-full of delicious APPLE THEME activities from all areas of the curriculum. In addition to general apple theme activities, there are activities that are specific to Johnny Appleseed and to How Make an Apple Pie and See the World. There are 22 different activities (38 pages), so you are sure to find just the right level/skill for your students. 1. Long/Short vowel sound activity: Read the words. Sort them onto the correct side of the apple short mat..
3. Apple Adjectives: Use all five of your senses to write adjectives describing an apple. 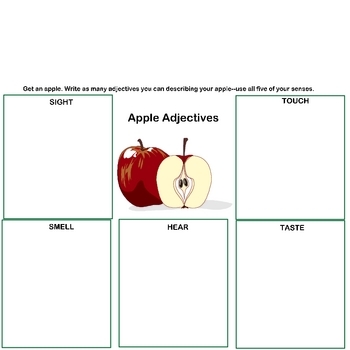 Record your answers on the Apple Adjectives page. 5. Johnny's Journey: Read the short paragraph about the places Johnny Appleseed planted apple trees. Find and color those states on the map page. 6. Sequence the Story: Put the story strips in correct order to retell the story of Johnny Appleseed. 7. The Apple Orchard: How many words can you form using the letters from the phrase APPLE ORCHARD? 8. Apple Vocabulary: Match together to apple theme vocabulary word cards with their correct definition cards. 9. The Apple Tree Finger Play: Read and act out the finger play "The Apple Tree"
10. Apple Facts: Read the page with the interesting apple facts. Which one did you find the most fascinating? Why? 11. The Little House with No Doors or Windows and a Star Inside: Read this fun and surprising story with a grown up. Have an apple and a table knife ready as read. 12. How To Make an Apple Pie: Put the sequencing strips in order to tell how to make an apple pie. the map in the back of the "How to Make an Apple Pie and See the World" book. 14. 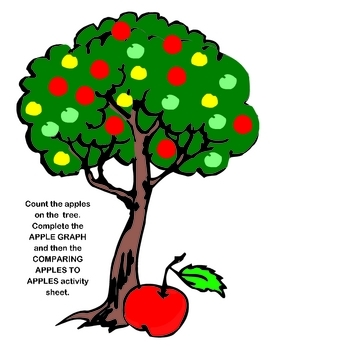 Apple Graph: Count each color of apple on the tree and then show how many there were of each color by filling in the apple graph. 15. Comparing Apples to Apples: Count each color of apple on the tree and then answer the questions on the Apple Comparison page. 16. Counting Apples: Put the numbered apples in orders from 1-20 . 18. 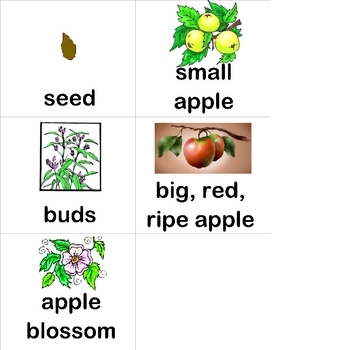 How an Apple Grows: Sequence the pictures of an apple from seed, to blossom, to small green apple, to large red apple. 19. Apple Subtraction: Without looking, choose two of the numbered apples and use them to create and solve a subtraction problem. Record your problem and answer on the Apple Subtraction sheet. 21. Apple Glyph: Follow the directions given to create your own unique data collection glyph. 22. Apple Flip: Flip the two-colored apple. 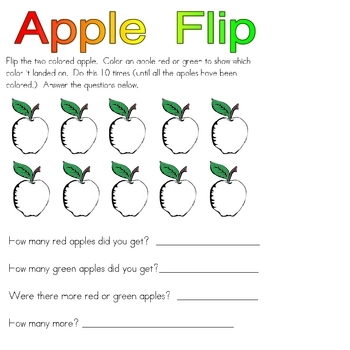 Color an apple on the Apple Flip page red or green to show what color it landed on. Repeat the steps ten times. Answer the questions at the bottom of the page.